If you've read Homer's Odyssey, you may well remember how Ulysses lands on the Island of Dino. And it's opposite this island, in Praia a Mare that our journey along the Calabrian coast begins. 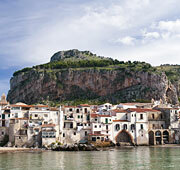 Take a boat along the coast and, as you approach Capo Palinuro, you'll see a succession of impressive caverns. At Sannicola Arcella the sea has formed an archway in the rock: the Arco Magno. The medieval coastal village of Scalea, clings, in layers, to the steep hillside. 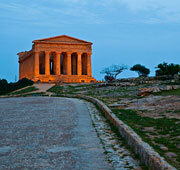 You must see the 16th century defensive Talao Tower, built by Carlo V and the handsome Santa Maria d'Episcopio Church. Returning to the main road and the Valle del Leo, you come to the ghost town, Cirella Vecchia. This interesting medieval town was left empty after a French attack in 1806. The lovely church, the castle and quaint cobbled streets are just as they were a hundred years ago. From the sandy beach of the new town of Cirella you can see a dramatic watchtower on the island which bears the same name. The road continues, hugging the Tyrrhenian coastline, to Diamante. 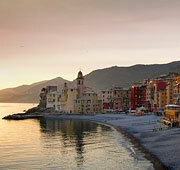 The historic centre of this town has been an inspiration to both Italian and International artists since 1981. Belvedere Marittimo, lies 12 kilometers further on. The name Belvedere, or "panoramic viewpoint" perfectly describes the vista of the sea from here. You will also find an 11th century castle, built by Ruggero il Normanno. The road takes you along the scenic Rizzi cliffs to Cetraro. Here, there are fine examples of the Baroque, for instance the Churches of San Benedetto and of Ritiro. A story of vicious religious intolerance is associated with the next town, Guardia Piemontese. Here the Porta del Sangue commemorates the murder by the Inquisition of Valdese disciples. 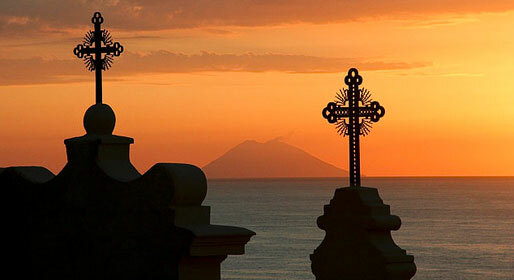 Calabria is characterized by a mixture of the influences of the sea and those of religion. The maritime town of Paola, home to the San Francesco Sanctuary and the three churches of Madonna of Montevirgine, of the Rosario, and of the Santissima Annunziata, seems to symbolize this. Finally, just before we reach the popular seaside resort of Amantea, we make the slightest of detours to the visit beautiful little town of Fiumefreddo Bruzio, from the terraces of which spectacular views of the whole coast can be seen.